According to reports from LIB, Police in Abuja on February 6th, 2016 disrupted a wedding between two men pictured above. 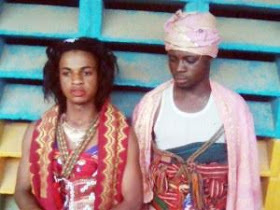 The wedding between Abdul Lawal (right) who is supposed to be the husband and Umar Tahir (left) the wife, was supposed to held at a hotel in Jiwa Community of Abuja, King’s Land Hotel in Abuja. Acting on a tip off, the police laid siege at the venue of the wedding, where guests had already started arriving which was well decorated. The bride and groom, both from Kaduna state, arrived were immediately arrested upon arrival and taken to the Gwagwa Police Station where they were detained. Eyewitnesses say that other people, including the sponsors of the wedding, chairman of the occasion and the owner of the hotel were also arrested during the raid. The sponsors of the marriage have been named as Abubakar Tahir and Mohammed Sani.